Hit a golf ball too hard on a putt, and it zooms past the cup. Hit a ball too softly, and it creeps toward the hole with no hope of dropping in. The right speed of a golf ball on a putt can make the difference between par and %$%^! One of the best ways to develop a touch for the speed at which putts should roll is to visualize what you want to happen. You must optically preview the putt’s roll from its stationary point to a resting place near the hole — a tap-in is really nice. View a putt from a point off to the side of the target line, midway between the ball and the hole, as shown in the photo. This technique can give you a better feel for the distance. 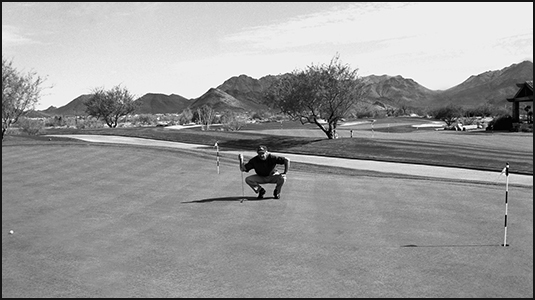 Some professionals swear they can visualize the proper speed of a putt twice as well from the side. Viewing a putt from the side can help you judge distance and speed. If the ball doesn’t go in the cup on a putt, it should finish 14 to 18 inches past the hole.